Joe Weissinger (right) marched in the Mummers Parade just three months after a kidney-transplant surgery. He's pictured here with his wife Bridget, son Joey and a fellow Riverfront Mummers N.Y.B. member. Just 365 days ago, Joe Weissinger suited up in the gold-and-red Riverfront Mummers N.Y.B. costume and set out on a parade that served a dual purpose. On one hand, he was marching with the crew with which he marched many times before. On the other – as made clearly evident by a sign his namesake son held that frigid January morning – he was getting word out that he needed a kidney badly. While not directly related to that “My Dad Needs A Kidney … #Kidney4Joe” sign, his social-media mission to get word out worked. A friend of a friend paid attention to his posts related to the membranous nephropathy that left him dependent on at-home dialysis to get through his days. In October, Mary Wagner Bracciale donated a kidney that gave Weissinger his life back. 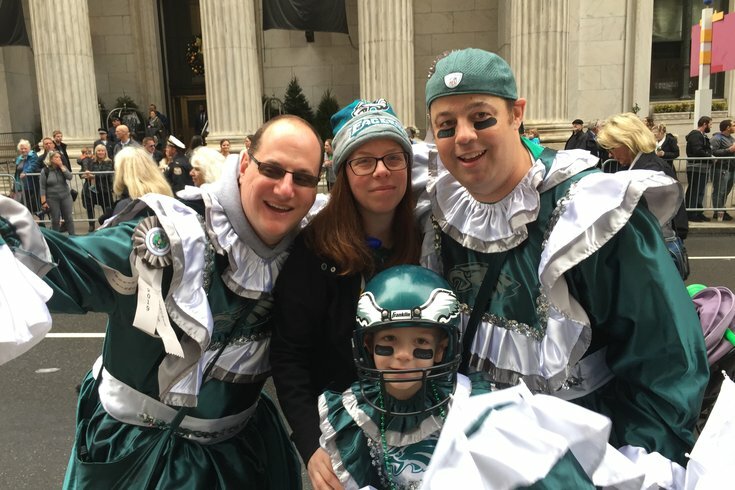 On Tuesday morning, that meant sporting the green Eagles-themed gear that Riverfront brought to Broad Street to celebrate the Birds victory in Super Bowl LII. The “E-A-G-L-E-S EAGLES” chants started even before they frolicked before the judging booth on the west side of City Hall and continued onto a Broad Street that saw droves of fans celebrating the Super Bowl win. He wasn’t lying. Just check 10 seconds in to the second of the videos embedded below to see for yourself. Happy New Year, Joe, Mary and both of your families.